On March 3, 2009, during the early AM hours last Sunday, inside a dimly lit server room somewhere in the ether, Skittles.com made the switch from a conventional candy retailers site to what can be described as a social networking hub. 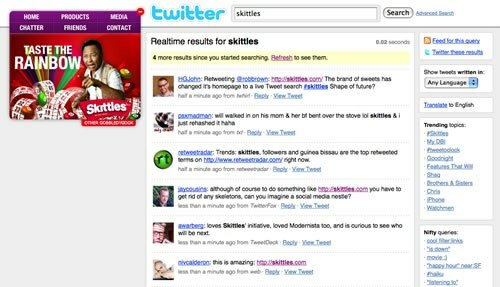 Upon visiting Skittles.com, users are taken directly to the candy maker’s Twitter stream. In lieu of any conventional form of navigation, the user is instead greeted by a widget-like console which floats directly on top of the Twitter stream itself. Users can click on links reading: Home, Products, Media, Chatter, Friends and Contact; which in turn link to Skittles’ profile pages on Wikipedia, Flickr, YouTube, and Facebook. In what is being viewed as an intelligent and innovative move within the social marketing and E-marketing communities, Skittles is essentially speaking to its audience using the language of its audience. While doing so, Skittles is aligning itself with some of the Web’s hottest and best known brands. Through simple brand associations, Skittles is letting the public know that they not only get them, and feel them, but also that they are one of them. While the concept is very good, the execution leaves a bit to be desired. From a Web usability standpoint, the widget-like navigation is a little obtrusive. While users can minmize the component, there is no way to recloate it to a different part of the screen. On most sites, this covers up the top left quadrant of the page, which usability studies show, is one hot piece of web real estate and often where very important information can be found on sites across the Internet. Please, Skittles, add “drag and drop” functionality to the component and you’ll improve what is already a very strong social makeover. Although I personally don’t believe Skittle’s latest campaign reflects a website architecture that will be widely adopted by other organizations, I do believe it recognizes the importance of connecting with members of the community, on a never before seen level. Skittles definitely gets it. Kudos to you!